A highly attractive Grade II Listed period cottage, formerly two cottages that have been extended to the rear, constructed of herringbone brick elevations beneath a thatched roof. There is a large driveway to the side of the cottage providing off-road parking and leading to a useful detached garage. The main mature garden extends to the rear of the cottage and enjoys privacy. The accommodation that has the tremendous benefit of reasonably good ceiling heights throughout, comprises an entrance hall, dual aspect sitting room with brick fireplace, dual aspect garden/dining room and a large farmhouse style kitchen/breakfast room with Rayburn and space for a large dining table. There is also a useful compact utility and shower room on the ground floor. 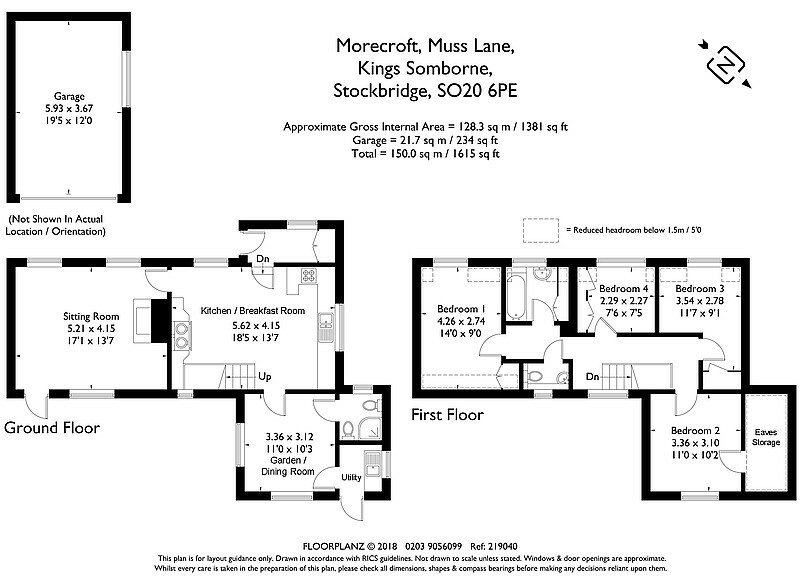 To the first floor there are four bedrooms, a bathroom and well fitted cloakroom. Agent’s Note: The property, whilst tucked away in a quiet location, is fairly central to the village and its useful range of amenities. The property is situated off a narrow lane along a ‘no through’ road in the popular village of King’s Somborne which offers everyday facilities including a Post Office/store, primary school, church and public house. The picturesque town of Stockbridge, traversed by the River Test, is just three minutes away to north and offers a variety of shops, Post Office, hotels and public houses, tea rooms/restaurants, churches, a doctors’ surgery and primary and secondary schools. The abbey town of Romsey is approximately seven miles to the south, and the cathedral cities of Salisbury and Winchester are both within a half hour drive. There are also excellent road links to London and the West Country via the M3 and A303 and also to the South Coast. UTILITY ROOM Part glazed stable door leading into rear garden. Roll top work surface with ceramic tiled splash back and inset 1½ bowl sink unit with mixer tap and drainer. High and low level cupboards. Recess and plumbing for washing machine. Exposed ceiling joists. Ceiling light point. Small pane window with quarry tiled sill to side aspect. Quarry tiled flooring. SHOWER ROOM White suite comprising pedestal wash hand basin. Low level WC. Glass/tiled enclosure housing Triton electric shower. Part ceramic tiled walls and floor. Window to front aspect. Ceiling light. Towel radiator. SITTING ROOM (Dual aspect) Two wide small pane windows to front aspect. Picture window and half glazed door to rear aspect opening onto the mature landscaped gardens. Open brick fireplace with brick edged quarry tiled hearth and quarry tiled display sill above. Exposed ceiling joists. Ceiling light point. Two radiators. LONG LANDING Window to rear aspect overlooking garden. Access to loft space via hatch. Pendant ceiling light point. Radiator. Doors to bedrooms, bathroom and cloakroom. PRINCIPAL BEDROOM (Double) Small pane window to front aspect. Pendant ceiling light point. Built-in wardrobe cupboard. Radiator. BEDROOM TWO (Double) Small pane window to rear aspect. Door into extensive eaves cupboard. Pendant ceiling light point. Radiator. BEDROOM THREE (L-shaped single) Window to front aspect. Ledged and braded pine door into wardrobe cupboard. Pendant ceiling light point. Radiator. BEDROOM FOUR (Single) Small pane window to front aspect. Shelving. Double doors into wardrobe cupboard. Pendant ceiling light point. Radiator. FAMILY BATHROOM White suite comprising panelled bath with fully tiled surround and sill to end, mixer tap/hand held shower attachment. Pedestal wash hand basin. Black and white mosaic tiled floor. Small pane window to front aspect. Towel radiator. Double doors into cupboard housing lagged copper cylinder, fitted immersion and slatted shelving. Ceiling light point. CLOAKROOM Corner wash hand basin with mixer tap. Low level WC. Ceramic tiled floor and part tiled walls. Small pane window to rear aspect. Ceiling light point. Radiator. The cottage fronts a narrow lane servicing a handful of properties. Shrub border with climbing roses, lawn and path leading to front entrance porch. Concrete path at end of the cottage leads round to the rear garden. Generous gravel driveway providing parking for at least 4 to 5 cars and leading to the garage. Driveway screened to one side by a raised shrub/laurel border with mature tree and to the other by an unknapped flint retaining wall. GARAGE Constructed of brick/part timber clad elevations beneath a pitched tiled roof. Up and over door to front. Light and power connected. Hatch into loft void. Timber shed with light and power and pergola to front. Wood store. LPG tank. MAIN GARDEN Extends to the rear of the house and comprises and attractive paved terrace with rockery to side. Flint wall retaining herbaceous border. Paved steps ascend to garden, laid to lawn with borders containing an abundance of shrubs and specimen trees. Substantial mature Yew tree with flower border. Ornamental pond with rockery, arched walkway and climbing plants. Seating area to rear boundary. All well screened by shrubs and trees and enjoys a good degree of privacy.